SAN FRANCISCO (Hypebot) – Crowdfunding platform Indiegogo offers a lot of resources for understanding music crowdfunding. In celebration of VidCon, they released a guide to "Monetizing Your YouTube Channel With Indiegogo." Like all their resources, they tend to emphasize Indiegogo's particular qualities but they also contain a lot of solid wisdom for those of you planning a crowdfunding campaign on other platforms. 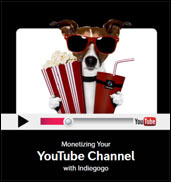 "Monetizing Your YouTube Channel With Indiegogo" is the latest resource from Indiegogo. I've listed some more at the end of this post. "as a way of connecting with like-minded audiences to make something big happen — and as a YouTuber, your advantage is that you already have a following of people who share your passions!" Even if we take a cliched vision of YouTubers as people with over-the-top personalities and an extreme connection to their audience, it's easy to think of musicians with similar personalities and connections. For me, Mojo Nixon comes to mind as does Dexter Romweber back when he was a wild child of the 80s. I'm not sure if Dexter could have pulled off a YouTube channel back then and these days he's not nearly as close to the edge but Mojo Nixon has had a few radio shows so I could see him being quite the YouTuber. Yet the suggestions Indiegogo shares for YouTubers are actually quite applicable to any campaign. Stretch Goals – "For example, you're asking for $50,000 to publish a book, but you tell your contributors that, if you raise $60,000, you'll also be able to do a concert, if you raise $70,000 you can make an album — and so on." Contributor Map – "You can…incorporate this into your project itself; for example, the top ten contributing cities will be the stops on your road tour. We've even seen campaigners post interactive contributor maps on their campaign pages to help leverage the global reach of their channels." Referral Contests – "You can use the tools provided to you in Indiegogo's Campaign Dashboard to track which individuals are driving the most traffic and contributions to your campaign — and then reward those people accordingly. For example, you could offer a top secret perk or exclusive opportunity to the winner." Live Hangouts – "Put that 'You' back into YouTube by leveraging Google's 'Hangouts on Air' feature that allows you to stream live on your YouTube channel. This is a good way to interact with contributors, answer their questions, perform, make special announcements, solicit feedback about your project and perks, or just have some fun." Video Annotation – "As part of their video annotation tool, YouTube allows you to share links to Indiegogo campaigns in your YouTube videos." YouTube Community – "There are bound to be opportunities for collaboration with your fellow YouTubers to help move your funding efforts forward — whether they join your campaign, offer a perk or two, or just share your campaign with their fans. You could also collaborate on a video together!" Video Comments and Replies – "You can also make use of YouTube's commenting and video reply features to interact with your audience about your crowdfunding efforts and to spread the word about your campaign." Interaction and Immersive Experiences [As Perks] – "Giving fans the opportunity to star in one of your videos, direct an episode, name a character, Skype with you, or just get a shoutout from your Twitter handle are all examples of easy-to-fulfill yet amazing things to offer your fans in exchange for contributions." VIP Soft Launch – "Who are your superfans? Identifying them and giving them access and first dibs on exclusive perks during a 'soft launch' of your campaign is a good way to build early momentum and heighten the contributor experience for your campaign."